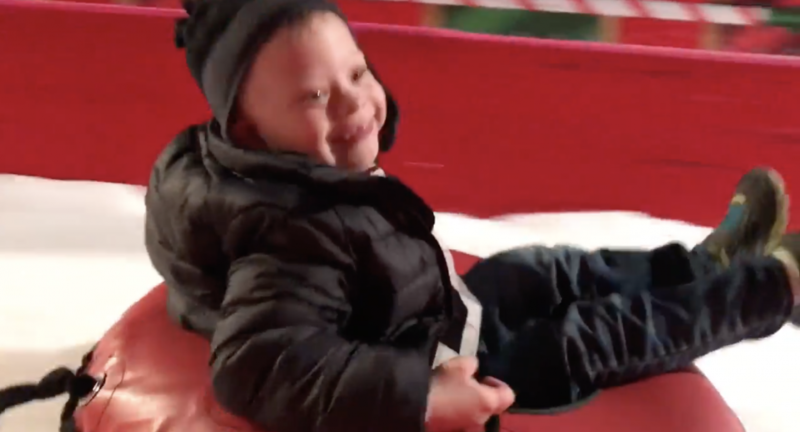 You are here: Home / Family / Snow Tubing Brings Noah a Lot Christmas Joy! The Gaylord Texan Resort (which is a huge hotel in our area) goes all out during the Christmas season. The entire resort is decorated for Christmas, they have a huge Ice exhibit that you walk through, an outdoor ice skating rink, and our kid’s favorite…snow tubing! Check out the video below to see Noah’s face light up with joy as he tubes down the “snow” hill! In case you’re interested in visiting the Gaylord Texan for some indoor tubing, here’s how it works. You pay 18.99 for 12 runs down the hill, which comes out to a little over 1.50 a ride. You buy your ticket, wait in line, grab a tube, walk up some stairs, then slide down the hill! Repeat. 12 times. As you can imagine it takes a bit of time to do that entire process 12 times. They sell a “fast pass” for an additional fee, but we like to save money…so no fast pass for us. If you’re planning on visiting the Gaylord Resort for Christmas, you should know that EVERYTHING COSTS. You pay for parking, and you pay for all the activities (and they aren’t cheap.) The good news is, you can spend a good amount of time just walking around their huge resort and taking in the great Christmas decorations (and other than parking, that’s free!) They also have an ICE exhibit where you put on jackets and walk around and look at awesome ice sculptures, but personally we think it’s over priced. At less than 20 dollars for 12 rides, I think that’s a much getter value. We’re fans of the indoor tubing, and think that it will become a family tradition! What are some of your favorite things to do during the holiday season? Leave a comment and let us know.